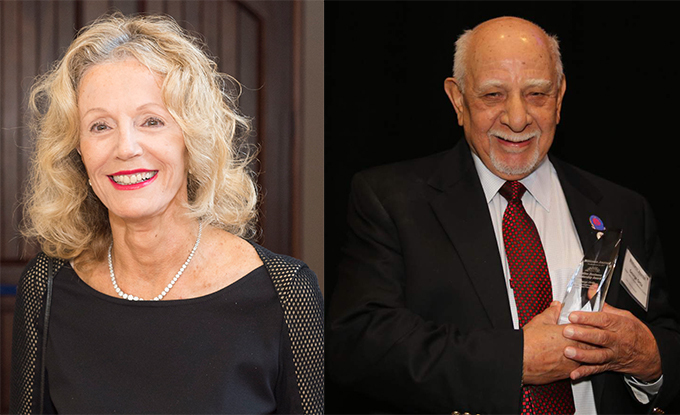 Honorary doctorates will be awarded to retired Professor of Education H. Andréa Neves and a longtime Northern California advocate for the underserved, George L. Ortiz, at Sonoma State University’s 57th Commencement ceremonies on May 20 in the Green Music Center, Weill Hall. Ortiz’s degree will be conferred at the College of Social Sciences ceremony at 1 p.m. on Sunday, May 20, and Neves’ conferral will be at the School of Education ceremony at 5 p.m. that same day. Commencement ceremonies will be held throughout the day on May 19 and 20. Born in the Central California town of Merced, Neves expanded her horizons with international study, an acclaimed university academic career and worldwide travel. Her interest in social justice and education has resulted in a philanthropic generosity that has engaged students and enriched campus intellectual opportunities. An Emeritus Professor of Literacy Studies and Elementary Education at Sonoma State University, Neves also taught in the Stanford University School of Education. She devoted her career to the application of her expertise in the field of global cultural anthropology, including speaking, writing and teaching of the implications of culture on the education process. Her research has taken her to dozens of destinations throughout the world. She and her late husband, Barton Evans, a successful Silicon Valley engineer and executive, have been active in philanthropy directed toward the support of education, both public and private, as well as the performing arts and social justice. They endowed professorships and academic funds at Claremont McKenna College, Phillips Exeter Academy and Stanford University. They also created the Neves-Evans Social Justice Lecture Series at Sonoma State University, which brings world-class speakers annually to SSU, including recently, Ralph Nader. Neves has also supported the Holocaust Grove and the Green Music Center at Sonoma State. Neves has served on numerous higher education-related boards and the Opera San Jose Board of Trustees. She earned a bachelor’s degree from Universidad de las Americas in Mexico City, a master’s degree from Sacramento State University and a Ph.D. in Education from Stanford University. A deep compassion and commitment to aiding underserved, Spanish-speaking communities has been the hallmark of George L. Ortiz’s long and distinguished career. From his first job after college as a social worker to later forming a grassroots alliance and non-profit social service agency, the efforts of Ortiz and his allies have made a lasting difference in the lives of thousands. The organization they founded, now called California Human Development Corp. in Santa Rosa, creates job training, housing, recovery and other services for farmworkers, day laborers and people with disabilities, serving 25,000 people in 31 Northern California counties. Ortiz served as its president and CEO for many years. Ortiz grew up in East Los Angeles, and his athletic prowess earned him a track scholarship to California State University, Fresno. He earned a degree in Social Science, served in the U.S. Army and first started working as a social worker, doing outreach to farmworkers in Sonoma County. Working with farmworkers and other underserved communities, Ortiz began conducting citizenship and English classes. With colleagues, Ortiz founded Latinos Unidos of Sonoma County, a nonprofit group that granted college scholarships, advocated for poor working families and served other needs in the immigrant community. Ortiz has been devoted to community service, including the Roman Catholic Diocese of Santa Rosa, Latinos Unidos del Condad de Sonoma in Santa Rosa, Consejo Latino de Kaiser at Kaiser Permanente in Santa Rosa and the Advisory Board of the Wells Fargo Community Reinvestment Act where he represents Sonoma County.